Eldar Murtazin Speculates On The Future Of The Samsung Galaxy S: RIP Super-AMOLED Phones? 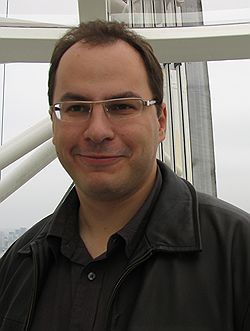 If there's one man with an inside line in the mobile industry, it's mobile-review.com's Editor-in-Chief Eldar Murtazin. This guy has a network of informants rivalling any national security agency you'd care to name. The latest subject of his (occasionally spurious) tweeting is Samsung's family of Super-AMOLED phones, namely the Wave and Galaxy S. Eldar seems to have some insight into the production and stock of S-AMOLED panels, leading him to think that neither of the two aforementioned phones are in production anymore because of S-AMOLED scarcity. 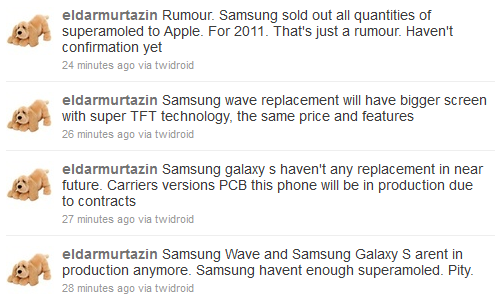 Murtazin goes on to indicate that the Galaxy S line does not have an immediate replacement in the pipeline (dash our hopes), and that all current stock of Samsung's stunning new screen tech has been sold to Apple for a product release in 2011. Thankfully the carrier versions of the Galaxy S phones do not seem to be affected as of yet, but this news surely implicates their future also. While these rumours aren't exactly the most palatable, it would be foolish in the extreme to ignore anything Eldar has to say on the subject of industry inside-baseball.